The fonts used for different elements in the Console can be edited. The font settings and the location where the font profiles are stored can be customized. The default font settings can be restored easily. This section also describes how to control other aspects of the appearance of the Console. For example, table columns can be easily rearranged. It is also possible to control which server instances are displayed (called a navigation view) which makes it easy to sort and find server instances. Access control instructions can be applied to user interface elements, which is discussed in Section G.5, “Setting Access Controls”. The Console formatting is stored in profiles. An entry's profiles can be stored locally, which means that they are only available at a specific workstation, or can be stored in the configuration directory, so they are accessible anywhere. Click Edit in the top menu, and choose Preferences. Select the radio button for the location to save the settings. In your configuration directory means that the settings are stored in the Directory Server configuration, making them available no matter where you log into the Console. On your computer's hard disk stores the setting profiles locally. This is mainly useful if you want specific, different settings used by default on different Consoles, such as a workstation and a laptop. 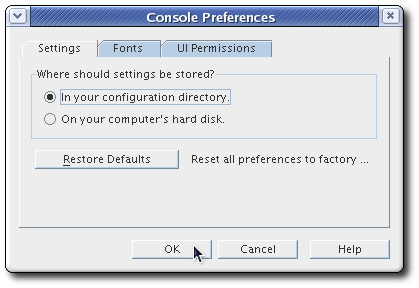 Click the Restore Defaults button to revert to the default display settings. Different parts of the Console, such as table headings and regular text, have different font settings. The font settings are stored in profiles. The profiles define the font family, size, and formatting for every text element. 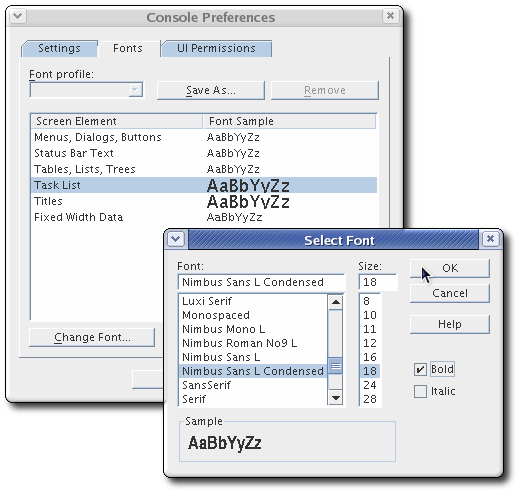 There can be multiple font profiles available, and the font profiles can be private, such as settings for a specific user or group, or public, so that any user can access them. The default profile can be edited without having to create new profiles. 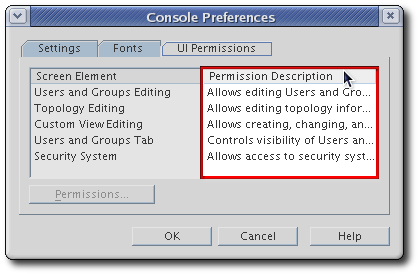 In the main Red Hat Management Console window, from the Edit menu, choose Preferences. To save the new settings as a new profile, click the Save As button, and fill in the profile name. To edit the default (or current) profile, simply begin editing the fonts. In the Screen Element column, click a screen element to edit, then click the Change Font button. Edit the font for that specific element. There are three settings which can be changed: the font family, the size, and the formatting (bold or italic). Restart the Console to apply the changes. To load and use a saved font profile, open the Font tab in the Preference dialog, and simply select the font profile to use and click OK.
To delete a font profile, simply make sure that it is selected from the drop-down menu in the Fonts tab, and click the Remove button. The columns in a table can be rearranged by dragging them into a new position. Click in the table heading. Still holding down the left mouse button, drag the column to its new location. The other table columns will automatically shift down to their new positions. When you release the mouse button, the column snaps into its new position. Different elements of the main Red Hat Management Console window can be displayed or hidden; this is set by check boxes in the View menu. There are three parts of the Console which can be hidden: the navigation tree (the smaller panel on the left of the Console window); the decorative background and banner at the top of the Console window; and the status bar at the bottom of the Console. 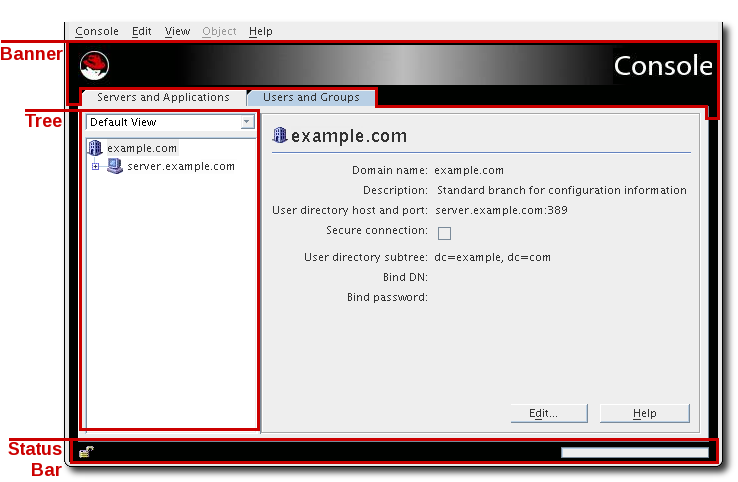 The Console allows different views to be created to show different server and domain entries in the Red Hat Management Console window. Views show only a defined set of server entries; this makes it easier to maintain large numbers of instances or to have a quick way to perform specific tasks. Custom views show different, defined server instances. Views are either public or private. A public view is visible to any user, while a private view is visible only to the person who created it. In the View menu, choose Custom View Configuration. 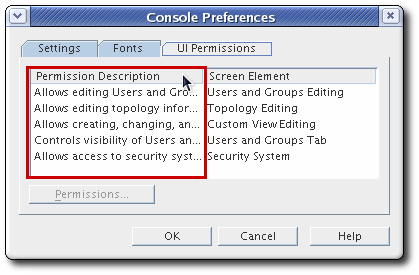 Choose whether the new view will be public or private, then click OK.
A public view is visible to all Console users by default, but access control instructions (ACIs) can be set to restrict access. 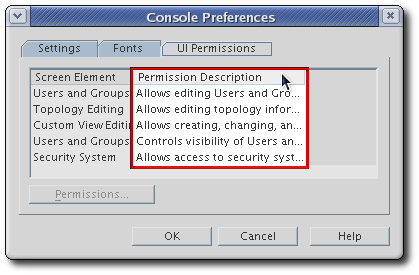 For more information, see Section G.2.6.3, “Setting Access Permissions for a Public View”. A private view is only visible to the user who sets it, and ACIs cannot be set to change the access to it. In the Edit View window, enter a descriptive name for this view. Select a resource from the Default View navigation tree on the left. Click Copy to list it in the panel on the right and include it in the view. To select a range of resources, click the SHIFT key and select the first and last entries; select multiple, separate resources by holding down the Ctrl key and selecting the entries. To edit a custom view, select it from the list, click the Edit button, and make the changes to the name or resources. To delete a custom view, select it from the list, and click the Remove button. Choose the required custom view from the drop-down list on the Servers and Applications tab. To return to the default view, choose Default View from the drop-down list. From the View menu, choose Custom View Configuration. Choose a public Custom View from the list and click Access. Set the access control instructions. For more information on setting access permissions and creating access control instructions, see Section G.5, “Setting Access Controls”.